Options: Initial Subscription - 6 Mos. Initial Subscription - 12 Mos. Don't wait for your school to purchase First in Math®—play on your home computer! Six-month subscription provides one User ID and Password. Individual players have access to the same site that schools do, including Skill Sets®, Workout Gyms and Bonus Games. Online Help section and more. Six-month subscription - $19.95 / 12-month subscription - $29.95. 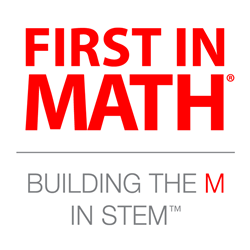 A First in Math® USER ID and PASSWORD will be emailed to you after your order has been submitted and approved. You MUST provide a valid email address on the order form. After you click PLACE ORDER, you will see a confirmation page. Hit the "click here for printable receipt" link to print a page that contains your User ID, Password and player expiration date.No shipping charges. (Pennsylvania and New Jersey residents will be charged sales tax).